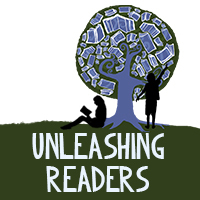 Goodreads Summary: Preteens prove that cultural differences can be overcome in this middle-grade novel about a native Mainer and a Somali girl who form an unlikely and supportive friendship. About the Author: Susan Ross lives in Connecticut. She was born and grew up in the Lewiston, Maine, area. Susan was inspired to write this story by incidents in her childhood hometown when refugees from Somalia began to settle there in the early 2000s. Kiki and Jacques is her first novel. 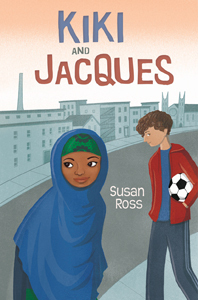 Susan Ross recently was interviewed by HuffPost Live and wrote an article on the HuffPost Blog about Kiki and Jacques and the amazing refugee kids in Lewiston, Maine — and especially, the vital importance of teaching tolerance/ multiculturalism to children! My Review: Kiki and Jacques is a perfect introduction to refugees for middle grade students. What makes the story work so well is that Jacques is just like so many middle school boys, so reading about Kiki and Mohammad from his point of view makes the story easy to connect with. The reader also gets to learn about the refugees and their lives and situations along with Jacques which makes it so students with no prior knowledge can live Kiki and Jacques story with them. Teachers’ Tools for Navigation: Kiki and Jacques is a book that many different students are going to love reading for many different reasons. It is a book for sports lovers, realistic fiction fans, and students who want to learn about something and make a difference. It is a great book for classroom libraries. Additionally, Mr. Gorman did an amazing activity with this novel using a mood meter. His blog post includes a wonderful writing activity. Discussion Questions: How does soccer play a role in the story? ; What did you learn about refugees in Kiki and Jacques? ; What do you think the theme of the book is? ; How does Jacques stay positive and “good” through everything that is going on in his life? ; How does Jacques help Mohammad and Kiki? We Flagged: “Frank Boucher broke out from the back and dribbled the ball toward the goal; in a minute he sliced it in. Boucher was tall, and broader than most of the kids. His bleach-blond hair was spiked marine-style, making him look even longer. Susan, this is the first novel you’ve written. Please tell us about it. KIKI AND JACQUES is a story about kids from very different backgrounds growing up in a small Maine town. It’s about finding common ground and friendship in spite of cultural differences and challenges. You were inspired to write this book when your hometown in Maine began to see an influx of Somali refugees in the early 2000s. Tell us a little bit about that experience and how the addition of Somalis to your home town changed the cultural landscape. When I was growing up, we lived in the “twin cities” in Maine—the old mill town of Lewiston and its sister city, Auburn. My great-grandparents came from Russia and opened a store. Three generations later, my parents had a bridal shop in downtown Lewiston. The majority of the population was of French Canadian descent, and my parents often sold dresses speaking basic French. When I read a magazine article about the wave of Somali immigration to Lewiston, I thought that a small Maine town experiencing such profound cultural change would be an amazing setting for a middle-grade novel. What kind of research did you do for this book? In researching, what did you find most interesting or surprising? As with most things in life, I found the very best place to start my research was at the library. In this case, I went to the library in Lewiston and met with a librarian, who told me something very important: in her experience, teenagers of all cultures were more alike than they were different. I spoke with a few Somali kids that day, who were at the library using the computers. I saw that they were on Facebook, just like my teenagers at home. Later, I met with other Somali teens and asked them to read chapters of my book. I was greatly inspired by how strong and ambitious these kids were, and I was touched by how glad they were to have an author listen and learn about their lives. KIKI AND JACQUES focuses on the importance of two kids respecting cultural, religious and racial differences, but still becoming friends. What do you hope young readers learn from this novel? I hope that I’ve written a story that kids can relate to. Kiki and her brother Mohamed’s lives are very different than Jacques’s in many respects, but they also have a surprising amount in common—soccer, strong loyalty to family, and great loss (Kiki’s dad was killed in the war in Somalia and Jacques’ mom died in a car accident). Each kid is looking for a safe and permanent sense of home and belonging. I knew I wanted to become an author when I was in the fourth grade and liked to stay inside at recess and write. My first book was called Diablo, and it was about a wild horse with cruel masters. Not so coincidentally, I had just finished reading one of my favorite books, Black Beauty. I became a lawyer, but after I stopped practicing law and my kids got older, I learned about the Somali immigration to Maine and thought, wow, this would be a wonderful and important topic to write about. If you could give any advice to young authors, what would it be? My best advice is simply that writers must write! Start a journal and keep it close, or take notes on your laptop or phone. Find a writing buddy and send ideas back and forth. Get your words down, whenever and however you’re inspired. Even if your writing isn’t close to perfect at first, it will get better, and you will learn and grow in the process—I promise! We have a large number of students whose families came from Somalia, so I was very glad to see this book. It has circulated very well! This sounds like a wonderful book! Thanks for sharing with the #diversekidlit link-up! Found this post via the #diversekidlit link-up! I’ve been hearing a lot about this book, and after you connected it to Kwame Alexander’s works, I just have to add this to my reading list! Thanks for the awesome post.